Finetec Artist Mica Watercolors are made with mica, a natural mineral that shimmers and shines. 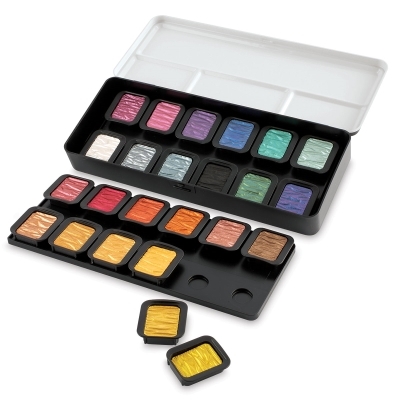 They're ideal for adding special effects and highlights to watercolor paintings, and also for calligraphy. Blend Mica Watercolors to create unique shades. Colors adhere to all absorbent surfaces, including paper, wood, and gypsum. Pans measure approximately 1-1/16" in diameter. 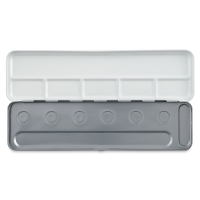 Note — Due to manufacturer changes, packaging may be different but the actual product will remain the same. 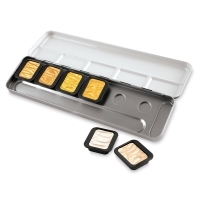 The pan shape for sets and individual colors is changing from round to square, but square pans still fit into existing Metal Watercolor Pan Tins. 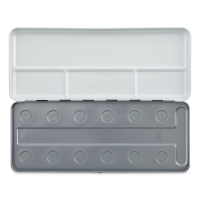 Empty Metal Watercolor Pan Tin for 12 Colors — Build custom Finetec watercolor sets with Finetec Metal Watercolor Pan Tins. 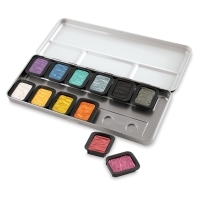 Add individual watercolor pans by popping them into the circle grooves within the tins, and easily pop them out when you're ready to switch up your palette. 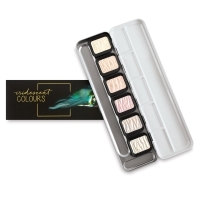 Empty Metal Watercolor Pan Tin for 6 Colors — Build custom Finetec watercolor sets with Finetec Metal Watercolor Pan Tins. Add individual watercolor pans by popping them into the circle grooves within the tins, and easily pop them out when you're ready to switch up your palette. Pearlescent Set of 12 — This set includes Amethyst, Blue Silver, Caribbean Green, Crystal Gold, Deep Black, Mystic Color, Orange Copper, Pearl Gold, Pearl Silver, Purple, Red, and Sapphire Blue. Iridescent Set of 6 — This set includes Amethyst, Gold, Gold Copper, Light Purple, Jade Green, and Sapphire Blue. Bronze, Gold & Silver Set of 6 — This set includes Arabic Gold, Bronze, Champagne Silver, Copper, Olympic Gold, and Silver. Warm Pearlescent Set of 6 — This set includes Hazelnut, Golden Rose, Fuchsia, Ruby, Tangelo, and Autumn Gold. Cool Pearlescent Set of 6 — This set includes Mint, High Chroma Blue, Platinum, Vintage Lilac, Emerald, and Patina. 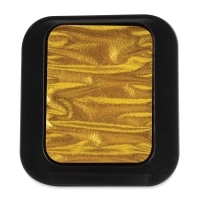 Gold & Silver Pearlescent Set of 6 — This set includes Olympic Gold, Royal Gold, Arabic Gold, Pearl Gold, Champagne Silver, and Silver. Pearlescent Set of 24 — This set includes Silver, Platinum, Blue Silver, Deep Black, Patina, Autumn Gold, Purple, Fuchsia, Amethyst, High Chroma Blue, Caribbean Green, Mint, Dark Bronze, Golden Rose, Orange Copper, Tangelo, Ruby, Red, Crystal Gold, Arabic Gold, Pearl Gold, Olympic Gold, Royal Gold, and Bronze. Patina and Autumn Gold are only available in this set.